This low trajectory compact 32 GPH Micro-Sprinkler on Spike is perfect for ground covers or orchards, greenhouses and nurseries. The smooth operation ensures uniform water distribution. 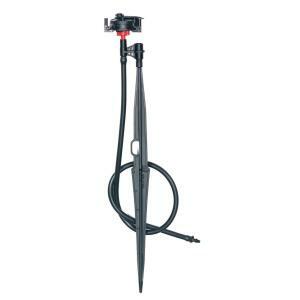 This sprinkler includes 24" of micro-tubing with barb for easily attaching to mainline poly tubing. The single stream adjustable micro-sprinkler can be adjusted from 30° to 330°. The maximum number of these micro-sprinklers on single run of 1/2" poly tubing is seven. Ideal for covering a large surface area.